From first contact with Amy in the shop till the final fitting we received a 5 star service. Paul came to measure and talk us through the process in a very friendly and professional manner. The lads who fitted the carpet and moved the furniture were brilliant. I thoroughly recommend. Very well laid carpet, neatly done in stairs and landing.Smooth service. I would like to thank you all for the good service received with my new carpets.I am thrilled, it all looks super.A special thank you to your two fitters who as usual were excellent, nothing was too much trouble and they went out of their way with removing furniture etc. Dear Paul and Jim, may I just say how delighted my husband and I are with the floor covering. Please do thank your carpet fitters for doing such a great job. I recommend Avonvale Carpets wholeheartedly.They fitted our carpet brilliantly for us.It has transformed our room.They made sure that we felt happy to call them in case of any questions and when we had a query Paul popped round to check on it.He also freely gave further advice about how to keep our new carpet looking good for the future.Thank you very much Avonvale.Great personal service with attention to detail. A huge thank you for all your help.From the moment Amy answered the phone to your fitters arriving in the most considerate and cheery way.I don’t know how you do it – but it should be bottled as precious know-how and sold on to other companies. We had hall and stairs carpet and vinyl flooring in the kitchen and downstairs bathroom.Avonvale were brilliant and very efficient.They came when they said they would come.They were nice friendly people.They had to do a lot of work to prepare the floor in the kitchen, more than they thought, but they just got on and did it.They are very accommodating and I’ve no hesitation in saying they are 5 stars. 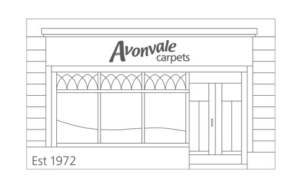 I was recommended to Avonvale Carpets and I wasn’t disappointed. A reliable, helpful service. There was no pressure to purchase a more expensive carpet. I would go there again.